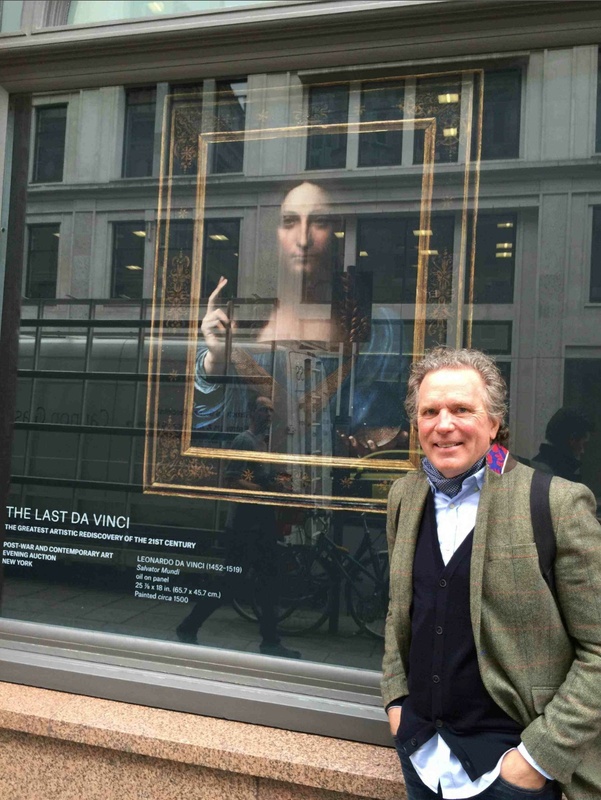 Clare and I have just returned from London where we had the supremely fortunate experience of coming face to face with Leonardo da Vinci’s ‘lost’ painting, Salvator Mundi, during a special two day showing at Christie’s. The uncanny presence of grace and power emanating from this ‘living’ portrait of Christ is a deeply mesmerizing offering of love by one of humanity’s greatest painters and an invitation to discover our own genius and the potentials we all have to bring light to heal our world. The crystal orb in his hand links us to the most cosmic of all mysteries. ‘Salvator Mundi is a painting of the most iconic figure in the world by the most important artist of all time,’ says Loic Gouzer, Chairman, Post-War and Contemporary Art at Christie’s in New York. “The opportunity to bring this masterpiece to the market is an honor that comes around once in a lifetime,” he said. It has been called the “Holy Grail” of master paintings. 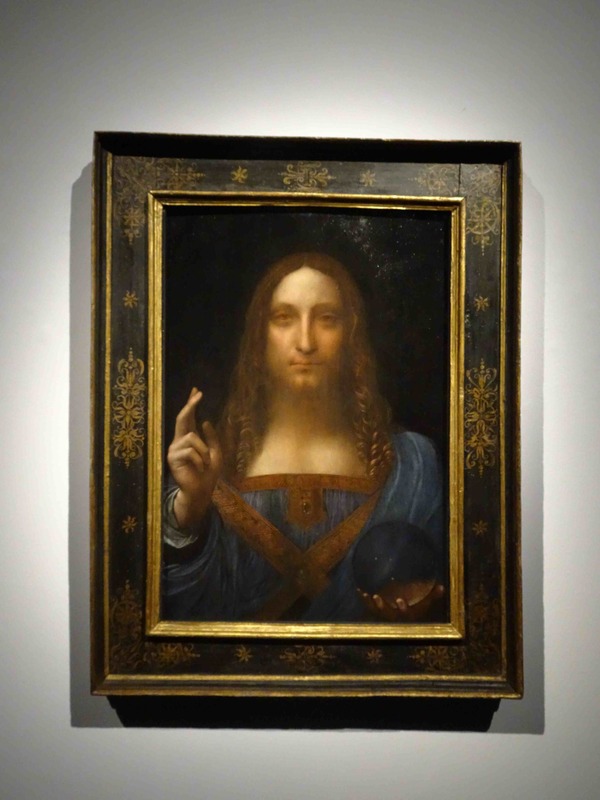 After reading about the November 15, 2017 auction of the painting in Gotham, I caught a one liner at the end of the Christie’s offer that said Salvator Mundi was making the rounds from San Francisco to Hong Kong and would be on display in London on October 24-25, 2017. How lucky were we! October 24, 2017 was our seventh wedding anniversary and we were in London! 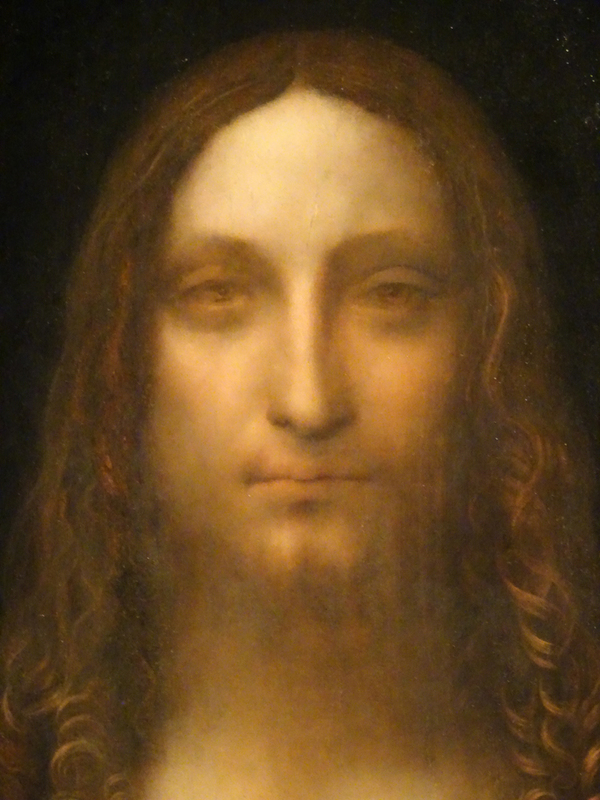 For Clare and I, experiencing Salvator Mundi, ‘the last da Vinci’, was a blessing in itself, as if all 2,555 days of our marriage led to this one day, this special moment. Quietly, but excitedly, we arrived at Christie’s at 8 King Street, one of London’s favorite playgrounds for the seriously wealthy and more modest sacred art aficionados (like Clare and I). We expected a long wait and huge crowds, so we were delighted when we entered Christie’s gallery and found only four people were ahead of us in line. While Clare chatted with them I took a peek at the Islamic image of the nativity of Christ gracing the wall near by. The Christ child was glowing, illuminated, an image of the Spirit of the Sun manifested on earth. How apropos for what we were about to see, I thought. 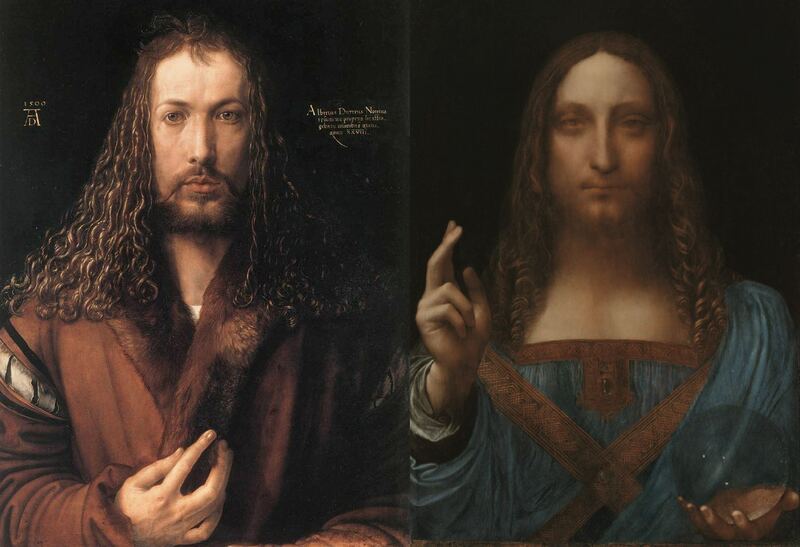 There is strong documentary evidence that Salvator Mundi was commissioned in 1506 by Louis XII of France who sought Leonardo to produce a painting of Christ which was completed in 1513. It made its way into the art collection of King Charles I of England in 1649, was auctioned in 1763 and then lost for nearly 200 years. It resurfaced in 1958. In that year, an astute collector could have plunked down $400 and bought a 1958 Gibson Les Paul electric guitar. Today, this American ‘hammer of the gods’ is the “Holy Grail” of guitars and is worth upwards of $250,000. That same year an even luckier American collector, a cosmically lucky one, paid less than $100 for a lost Leonardo painting that 60 years later is expected to fetch over $100 million when the hammer falls at Christie’s auction on November 15, 2017. Its recovery was led by Robert Simon, an art historian and private art dealer who assembled a consortium of art dealers, and it was restored by Dianne Dwyer Modestini. Many unique qualities of this painting led experts to confirm that it is indeed an original work of the great master, one of only fifteen now in existence. It was displayed in the National Gallery in London during the Leonardo daVinci: Painter at the Court of Milan from November 2011 to February 2012. Sadly, we missed that opportunity. But fortune smiled on us in 2017. The ultimate pop-up showing was now happening. We waited in silence for a few more minutes, and then, the guard motioned that we could enter the side gallery where Salvator Mundi awaited. My pulse quickened in anticipation of this religious experience, almost as if I were about to meet the Master himself…or see my bride coming toward me on our wedding day. That’s for sure. They take us to the precipitous edge of the cliff of uncanny valley where the supernatural and the natural worlds meet. This all-too-elusive intersection is a portal, a gateway to transformation, and even, to heaven. One left turn around a wall and Clare and I stepped into Leonardo’s vortex. Contemplatively, respectfully, we crept in. The room was silent save for the clicks of cameras. Suddenly, a well-heeled couple jumped the cue and lurched ahead of us. They must have been excited about burning a hundred million on what could be a revelation of the mystic Christ. It doesn’t get any better for a Leonardo lover than to stand inches away from and face to face with one of his lost paintings, especially with only eight other people, plus two Anubis-like guards, in the room. Any one who has ever been just another face lost in the massive crowd that gathers daily, and goes mental, around daVinci’s Mona Lisa at the Louvre can attest to the X factor in his manifestations; which explains our joy at this extraordinary surprise opportunity to stand together just inches away and peer into Leonardo’s Christ’s eyes. It like our venture into this vortex was meant to be. In person, the painting is surreal. It is as if Christ stood up from Leonardo’s famed Last Supper and posed for him. His hair is reddish or auburn and curly. He raises his hand in blessing. 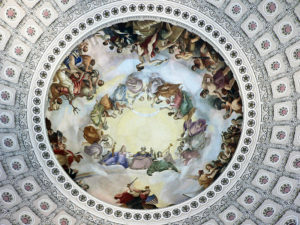 Both Christs are ethereal and exude a power only possible by a balanced masculine and feminine. Just look at his tunic. Typical of Leonardo, many of the objects in this painting have a deeper significance which is not at first obvious to the eye. The eight-pointed center star surrounding the pearl on his solar plexus originated with Melchizedek and signifies resurrection. It corresponds to the eight lines of the threads found on his Renaissance-style stole, as well as a fascinating array of 8-pointed revelations (too voluminous to discuss here). The ruby represents martyrdom and passion. The 8-pointed star at his solar plexus is a gateway to a vast path of mysteries centered on Lord Melchizedek and a tribe of eternal beings. The face with its Mona Lisa smile is hypnotizing. Christ’s face is breathtaking, ethereal and somewhat blurry, as if He is neither fully here nor in the dimension He has just emerged from or phased out of to make this appearance. The eyes are orange and lion-like. The Master’s mesmerizing eyes gaze, penetratingly. They are glazed. One is higher than the other. Interesting. The great master was obsessed with capturing the mysteries of light. Here, the Light of the World is gazing back at us with a look that comes deep from other-where-when. Penetrating matter. Our atoms are rearranging themselves to match the frequency of His. Yes, the light of the world is within. Absorb. Absorb. Absorb. Connect. Connect. Connect. Be. Be. Be. The mystery of this painting is deep and alluring. There is clearly something more going on with it than meets the eye. Transfixed begins to cover how we felt standing before it. Right away, our eyes lock on to the glass sphere or crystal orb in Christ’s hand. Translucent. Bubbling. Practically alive. 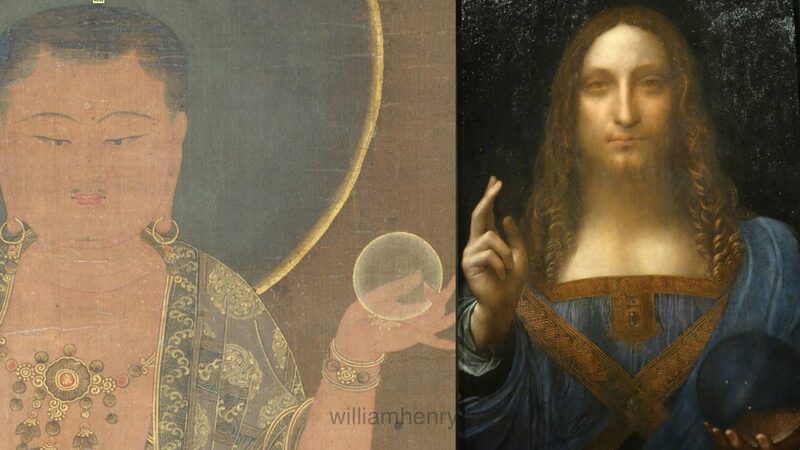 Art historians are baffled by this solid, glass orb that, they say, lacks optical exactitude, and has caused them to question the authenticity of the painting. To unseeing eyes, the orb appears to be a mistake. The three dots in a triangle leap from the image. “It’s the chintamani!”, I said, when Clare first showed me the article announcing the discovery of this gem in 2011. He is holding the stone of heaven, I said. The wish fulfilling jewel of Tibetan Buddhism, it is symbolized by three dots arranged in a pyramid. It is easy to spot once one knows what it is. 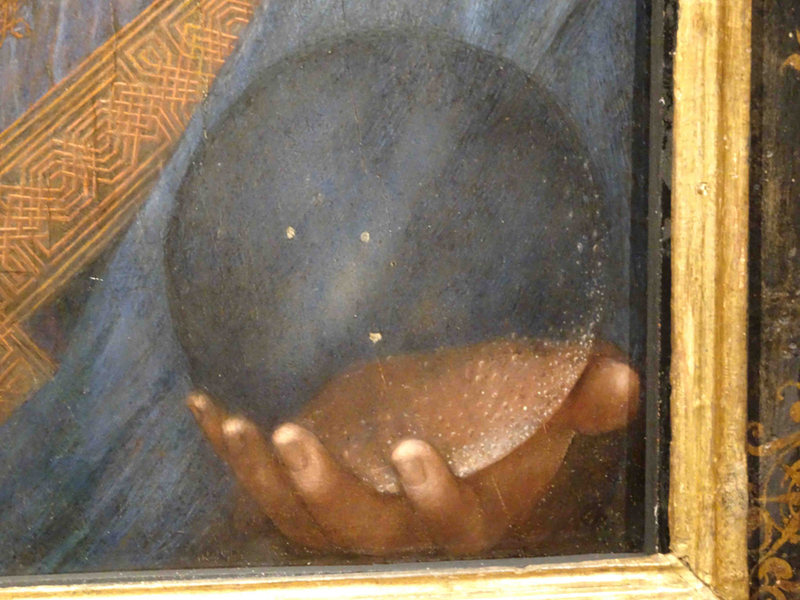 Only then can one discern what Leonardo wishes for us to see. They who hold the chintamani, as did Buddha, possess the powers of the universe. “It’s the three stars of Orion’s Belt!” said Clare. We are both right. The crystal orb bubbling up in Christ’s hand is a symbol for a power source beyond human comprehension. It is a living substance from another dimension. It is the power of universe itself. Russian painter, Nicholas Roerich, who sought this stone, said it came from Orion. Its presence in our world signifies disclosure of a cosmic secret. Comprehending it requires an evolution of our consciousness and an awareness of our potential as awakening angels. This is what Leonardo wishes for us to see and experience in the portal of this painting. The world Leonardo wishes for us to save with is Grail stone of heaven is our own. The numinous, no glimmering, specks of golden light on the glass orb. The bubbles within it. He is offering it to us! 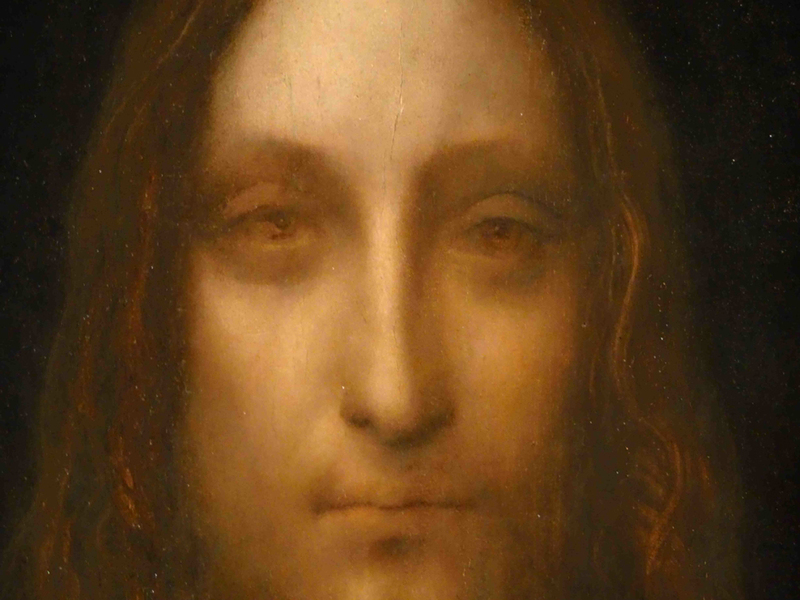 Clare and I have spent many years gazing in the eyes of Salvator Mundi and seeking the chintamani. One question we often pondered was who was the model? It could have been Albrecht Durer, who bears a remarkable resemblance to daVinci’s Christ. Could the model have been Christ himself? We discussed this possibility in an episode on the Shroud of Turin on our Gaia TV program “Arcanum”. 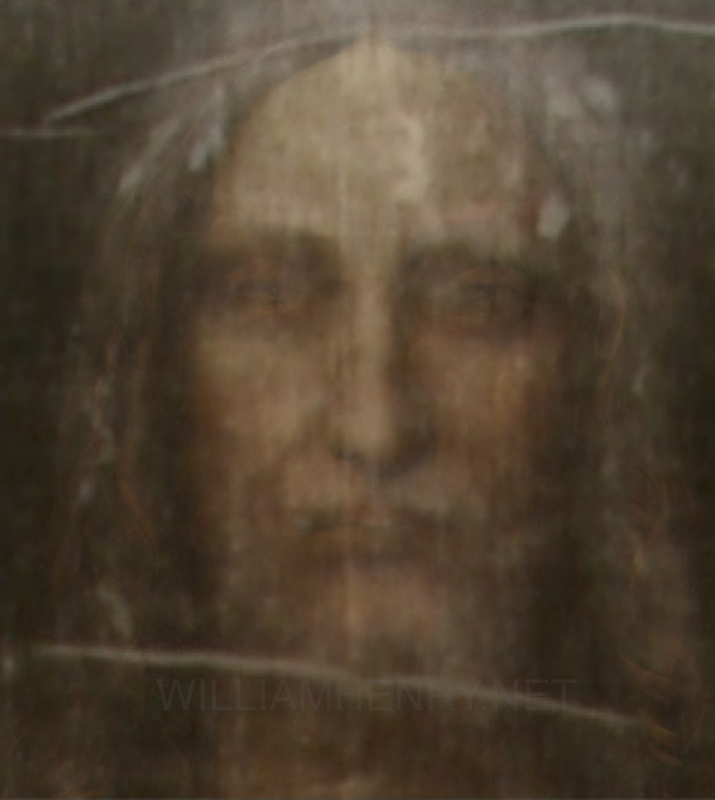 We compared the face of daVinci’s Christ to the face on the Shroud of Turin and pointed out the connection to the chintamani. 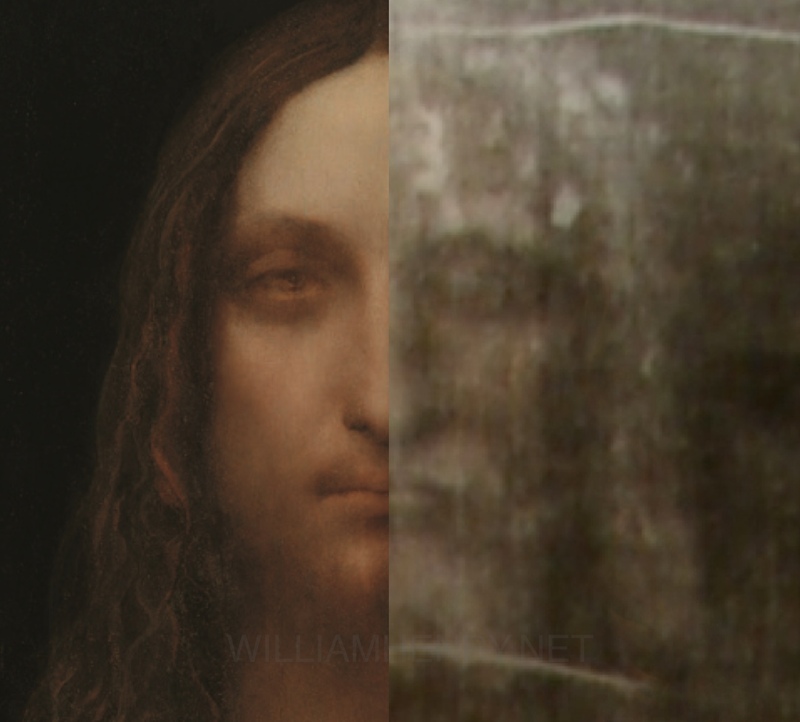 Leonardo’s Christ face is a near perfect match for the face on the Shroud…a fact completely missed by the media mind. Had he seen the Shroud of Turin? We asked. Or, even more fantastically, did he have a vision of Christ that enabled him to make this portrait? To the art world this painting is more than a treasure. To Clare and I it is more than a painting. It is a divine conduit. It is an icon of love, like the Shroud of Turin. Having experienced the Shroud together in 2011 and 2015, we know that it is an active icon, a transmitter of the divine light. The words of Michael Daley, the director of ArtWatch UK, suggests we are on the right track. 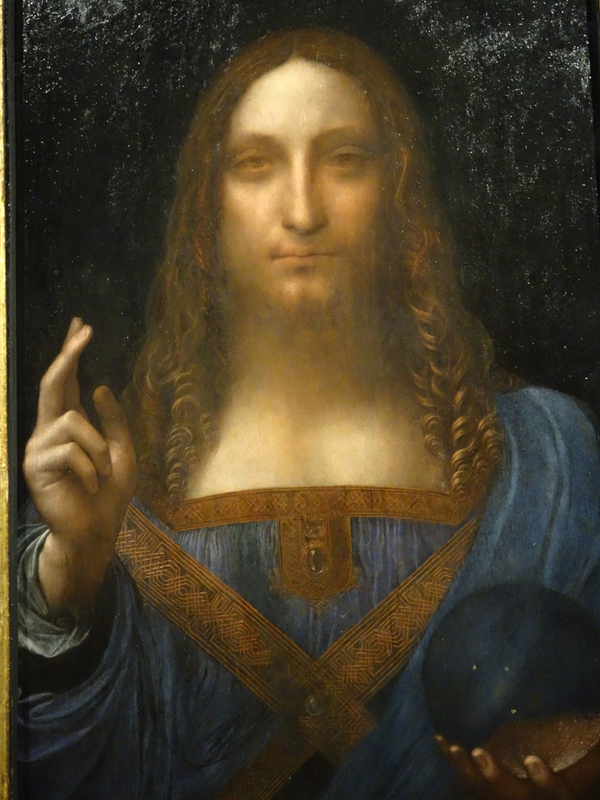 Although he isn’t convinced Salvator Mundi is a Leonardo, he notes it is dead-pan flat, like an icon. In our view, it is not just like an icon. IT IS an icon, meaning it is a sacred mirror or portal to the divine. It was created by Leonardo to manifest a vortex through which the miraculous blessing power of the chintamani can be transferred. To begin to receive this power, all we have to do is gaze into the eyes of Salvator Mundi and reveal the light from within. 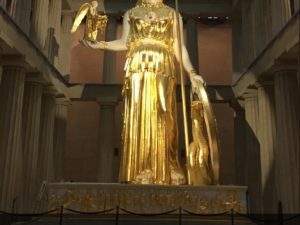 This article is a real showstopper, thanks for sharing your experience. I swear in the last close up of the face I see the sacred symbol for Om in the centre of the Christs forehead ॐ either that or a number 3. Best wishes to you and Clare. But why does this Jesus appear to be so European/Caucasian/White? I think he painted himself, a self-portrait. Showing the mirror, the divinity with. Male and female. 2 halves. Goosebumps with the Orion link! Great article. This article captivated me almost as much as the painting. I felt like I was there with you. I just became aware of this painting today and discovered that I am extremely interested in the topics you discussed above. I feel as if you have awoken something inside that I didn’t know was there. Hard to explain, but I sincerely thank you for this. Thanks for pointing out the match with the Shroud. I saw the Shroud during the Soccer World Cup in 1990. I felt the power. Lourdes water blessed him as we all gathered in the kitchen to pray for him with the intercession of Our Lady of Lourdes… She has been with us always on this journey called brain cancer/healing/show me your path Lord as I proclaim without ceasing the LOVE/LIFE/LIGHT I have been given as I found Faith. I do not think the three dots on the orb represent the threes stars in the constellation Orion, I think DaVinci was much more mathematically oriented and the exact orientation is that of Mars and it’s two moons Phobos and Deimos. It may indeed represent a specific date in time. 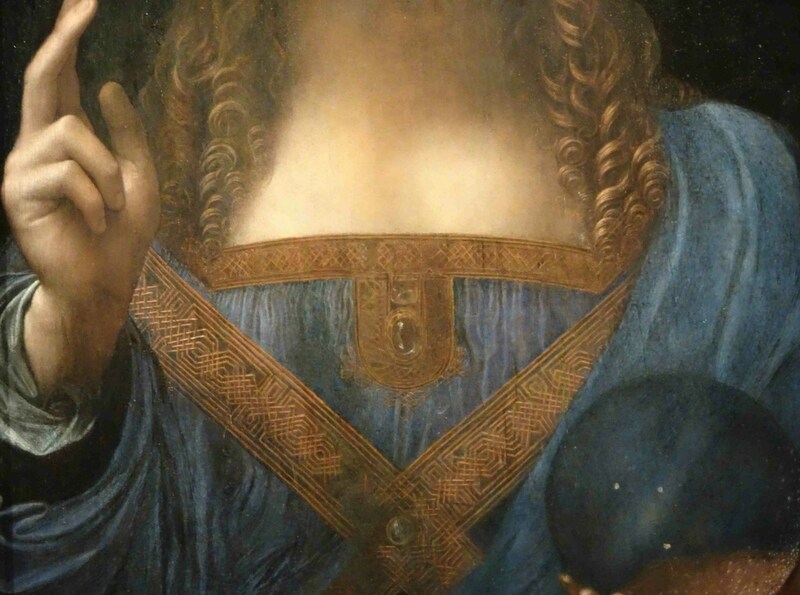 This article and insight is fascinating (I came her via Ancient Aliens Season 13)… what did you mean by the last line please- To begin to receive this power, all we have to do is gaze into the eyes of Salvator Mundi and reveal the light from within. I have been captured by this painting since the news came out. I put it on my phone home screen so I can look at it every time I use my phone. It reaches into my on a visceral level, beyond words. Thank you for showing us the 8 pointed star. I agree He is holding the Chintimani, offering it to humankind with His loving and gentle blessing. But when I saw your overlay with the Shroud, my heart actually leapt! 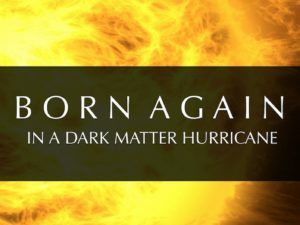 That it should come to us in this confused and troubled age is a gift from God. As for those disturbed by how European he appears, consider Leonardo’s time and culture. However, there may yet be another mystery to be revealed by that. This work is layers and layers deep. Good afternoon, I made an observation on the 4th to last picture and I happen to see a sprit (facing to the left almost like a fetus and it also looks like it carries a fetus within) being represented inside the crystal ball. Perhaps it is further representing birthing creation. Interesting article, thank you for sharing. 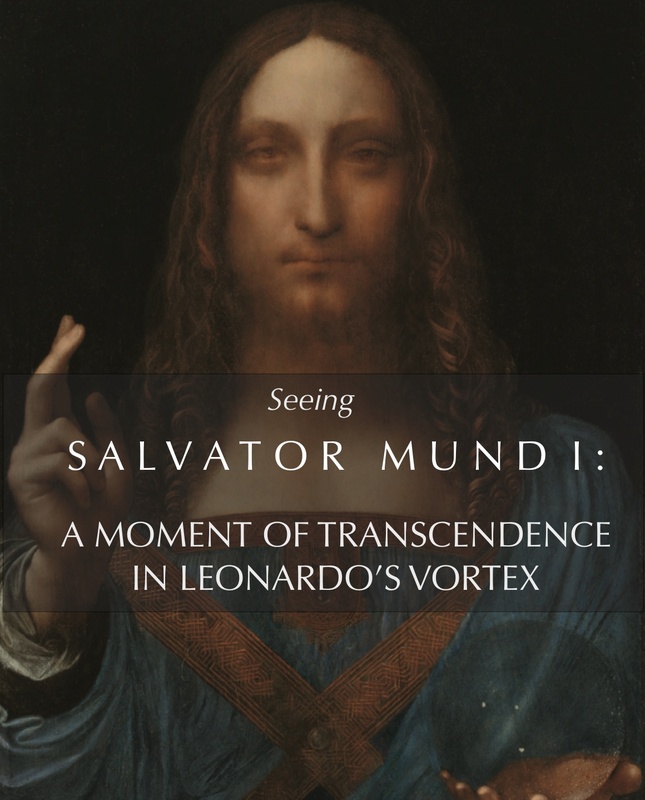 Wonderful Analysis and Meditative Analysis of the Mysterious and Evocative ‘Salvator Mundi.’ As an Artist/Designer myself (including many book covers with David Hatcher Childress and other Authors represented by Adventures Unlimited (like your excellently written and illustrated books). I am very interested in your insights regarding the Shroud of Turin, 8-pointed Star and Chintamani Stone that you point out are profoundly intriguing. 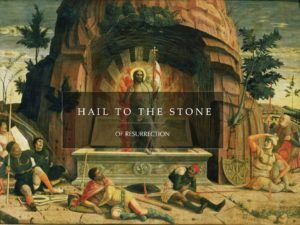 Nobody knows where Christ spent those many years before returning to begin his Mission (I might propose youthful ones with the Essenes and perhaps later visited Northern India absorbing Vedic and Buddhist teachings) but that has implications regarding the Sacred Stone. I also seem to remember an instance where there was speculation that Leonardo had created a ‘Shroud of Turin’ replication using some Alchemy using himself as a stand-in. To me the ‘Salvator Mundi’ IS Authentic, The Power of Jesus Christ lives forever and Leonardo da Vinci the Greatest Master ever. It can be quite Illuminati-ing to ponder their Mystery.